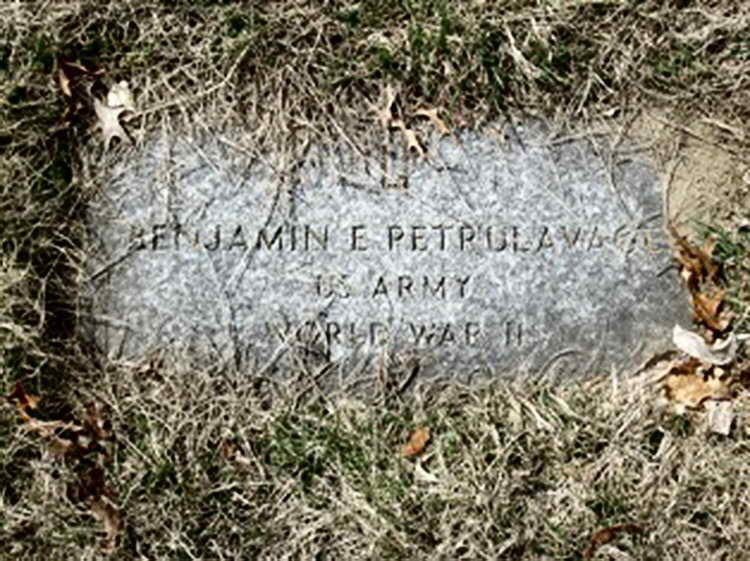 Grave marker for Benjamin E. Petrulavage in the Saint Josephs Cemetery Medway (Norfolk county), Massachusetts. Benjamin enlisted in the Army at Boston, MA on 11 March 1941 and later volunteered for parachutist duty. By July 1944 Pvt Petrulavage was a member of Company E, 508th PIR. He was promoted to Pfc on 1 October 1944. On 3 February 1945 Pfc Petrulavage was taken off the line and listed as slightly injured, perhaps a victim of frostbite. Evacuated to a field hospital he was subsequently to another hospital, probably in the UK. He did not return to the regiment and was discharged on 10 November 1945.